Of all the current e-bike builders, San Francisco’s Alta Motors has the most buzz, because they focus on building extremely competitive off-road competition machinery. The success of their Redshift model is partly due to their founders’ backgrounds: Derek Dorrestyn (Chief Tech Officer) had a dirt-racing career, is a trained industrial designer, and counts two AMA Hall of Famers in his immediate family. Jeff Sand (Chief Design Officer) spent years as an industrial design pioneer and invented the modern step-in snowboard binding at Switch. motorcycle show circuit. The result was the silent dragster called “Crapshoot,” and the press flipped for it. 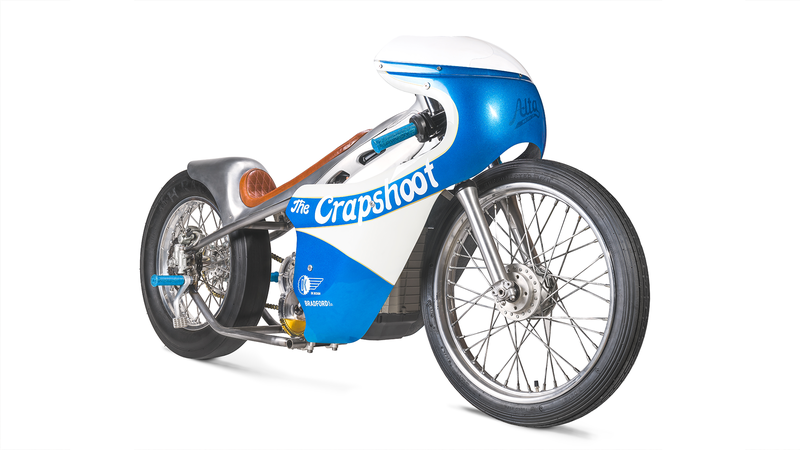 The “Crapshoot” has just enough traditional drag-bike styling to look vintage, but a quick motor check reveals the Redshift heart underneath that fairing. “I planned on it having a hardtail from the beginning, and getting it as low as possible.” He was inspired by 1960s dragsters like Boris Murray’s twin-engine Triumph, and Leo Payne’s “Turnip Eater.” “These guys built fantastic machines out of garages in the ‘60s, and I wanted to reflect that hand-madeness.” The “Crapshoot” hits all the right notes, and is among the first electric customs to excite even dinosaur-burning traditionalists, by showing respect to the best builders of the past. “Crapshoot” has been featured in The Vintagent and RideApart.